The aftermath of Tuesday’s storm is still being felt by some. 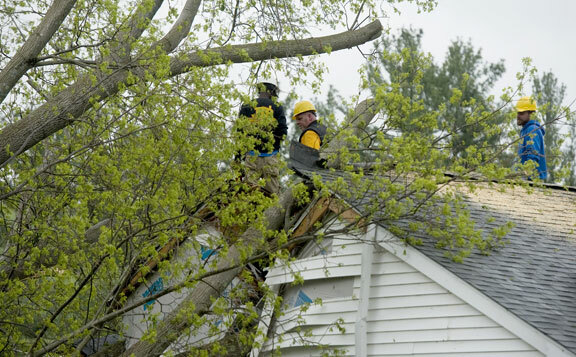 The National Weather Service has confirmed four tornadoes touched down during the storm, including one in Beacon Falls that continued for about 10 miles to Hamden. 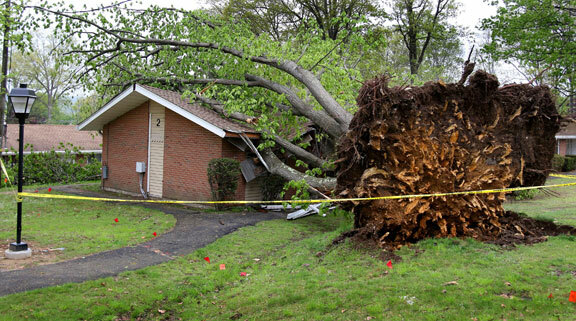 The storm brought down trees, utility poles and wires across the area, causing significant damage in spots. The town was one of the hardest hit in the area. As of 2:15 p.m., Eversource reported there were 2,028 customers in Beacon Falls, or 73 percent of town, still without power. Eversource estimates power will be restored in town by Friday at 11:59 p.m.
First Selectman Christopher Bielik said crews are working across town to clean up fallen trees and downed wires and to get roads reopened. “We’re making steady, incremental progress,” he said. At the height of the storm, there were about two dozen roads closed, according to Beacon Hose Company No. 1. As of Thursday afternoon, Bielik said the number of roads that are completely impassable was down to a handful. Three crews were working on Skokorat Road, one of the hardest hit spots in town, on Thursday Bielik said. Crews were also working on Burton Road, where a mass of trees, utility poles and wires fell, he said. As of Thursday afternoon, Beacon Hose reported Skokorat Road was being monitored by police at Route 42 and the top of the hill, but it is reopened from Route 42. Beacon Hose urged residents to be cautious of one-lane roads and detoured roads when driving. The company also warned residents to treat all downed wires as live and dangerous. Beacon Hose reported a brush fire start Wednesday night on West Road after a downed wire was re-energized. Trash pickup has been pushed back to Saturday. Bielik said the transfer station will still be open Saturday, but the town won’t be accepting brush or debris from the storm at the station. Once the town is back up and running, he said town crews will go around town and pick up debris curbside. He asked residents to be patient and hold on to any debris until the town is ready to pick it up. Town Hall, 10 Maple Ave., and the Beacon Falls Senior Center, 57 North Main St., are open for people to recharge their electronic devices, Bielik said. Woodland Regional High School will be opened through Saturday from 9 a.m. to 6 p.m. for Beacon Falls residents to use the locker rooms to shower, Region 16 Superintendent of Schools Michael Yamin announced. Residents should enter the school through the entrance by the gym. Schools in the region, which is comprised of Beacon Falls and Prospect, were closed on Wednesday and Thursday and will be closed again Friday. The closures are due to the damage from the storm and power outages in Beacon Falls. Laurel Ledge Elementary School and Woodland Regional High School in Beacon Falls don’t have power, Yamin said. In a letter to parents, Yamin said the Board of Education will address the schedule for the end of school and graduations at its meeting next Wednesday. The district saw virtually no damage to buildings, though two utility poles fell at Laurel Ledge, he added. The district plans to move ahead with sports, weather permitting, Yamin said. Yamin said the district plans to fill the generators at Woodland and Laurel Ledge, and will make a decision on Woodland drama club’s production of “The Wizard of OZ,” which is scheduled to open Friday, pending electricity being restored or if the generator can support the auditorium. As of 2:15 p.m., there were 684 customers, or 5 percent of the borough, without power, Eversource reported. Eversource estimates power will be restored in town by Friday at 11:59. Residents without power can shower at Naugatuck High School, 543 Rubber Ave., from 5 to 7 p.m. Thursday. Residents are asked to enter the school at the pool entrance near the tennis courts. There will be staff there to assist residents. Residents can drop off debris from fallen limbs and trees to the Heights, located behind the Naugatuck Police Station on Spring Street, from Thursday to Sunday between 8 a.m. to 2 p.m.
Naugatuck schools were closed Wednesday and Thursday, though sports were scheduled to play on Thursday. As of this post no decision had been made on school for Friday. Messages left with the mayor’s office the Board of Education and Public Works Director James Stewart seeking comments were not retuned as of this post. The town lucked out, all things considered. “We dodged a bullet,” Mayor Robert Chatfield said. During the height of the storm, he said, nine roads were closed. They were reopened and the town was operating as normal by Wednesday afternoon, he said. Two houses had trees fall on them during the storm, one on Corrine Drive and the other on Cornwall Avenue, Chatfield said. No injuries were reported. Chatfield said the Prospect Volunteer Fire Department responded to 20 calls during the storm. As of 2:15 p.m., Eversource reported there were 33 customers, or 0.8 percent, in town without power. Mr Bielik’s poor management and poor business decisions have cost the town thousands. What he does best is talk about how great he thinks he is. The Board of Finance made it very clear this was a very bad decision and fought to prevent it from happening. Mr Krenesky please let the people of Beacon Falls know exactly how much this is costing us. Also have we made any money on this blunder. I’m on my way to Rice lane extension with a load of debris. Better yet, drop off the brush on the solar panels at Chris Bielik’s house. All Beacon Falls residents should drop off their tree limbs and brush off at Chris Bielik’s house on Rice Lane Extension since there are solar panels he approved where we normally bring our brush.